Speakers will discuss the impacts of increased rail traffic on the Portland-to-Vancouver, B.C. rail corridor, at an upcoming Northwest Business Club meeting. Bruce Agnew, director of the Cascadia Center for Regional Development. The center promotes high-speed passenger rail between Eugene, Ore., and Vancouver, B.C. Jim Miller, executive director of the Whatcom Council of Governments, a transportation-planning agenda. When: 11:45 a.m. (lunch buffet starts), noon (meeting starts) on Aug. 10Where: Elks Lodge, 710 S. Samish WayCost: $10 for annual members, $15 for others. 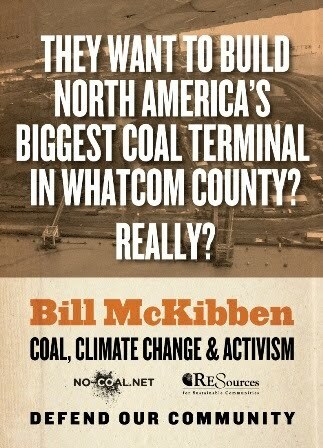 RE Sources is hosting Bill McKibben at the Fairhaven Village Green on Tuesday, May 31st at 5:00pm. The event starts with an information fair and a performance by local band Mille and The Mentshn at 5pm, Bill will take the stage at 7:00. This event is free and open to the public. Invite your friends and neighbors! Click here for more information. The following evening, Mayor Pike of Bellingham will hold a listening session regarding the coal terminal at 6pm on Wed, June 1 in the large courtroom in Municipal Court. It is important for county residents to make a showing at both the McKibben event and at the listening session to be sure that our voices and concerns are adequately represented and expressed. For those of us living along the alternative or inland route, you might want to brief your self on Mayor Pike’s firm stance towards BNSF considering this route for coal transport and prepare to speak at the meeting in response to similar assumptions. While BNSF followed Pike’s public comments with their own public announcement claiming that the shoreline route is the only practical route to the proposed GP terminal,we’ll be posting a few facts here on why we don’t trust BNSF. For now, consider attending these events to speak up and defend Whatcom county-wide from the proposals currently on the table from SSA Marine and BNSF.